The Treaty of Paris in 1763, ended the Seven Years War which was a worldwide war between Great Britain and France. It was called the French and Indian War in North America. As a result of this treaty, the French gave up her holdings in North America and India. Thus, England became the dominant world military power with the largest naval force and the largest army in the western world. But, the British Parliament under Prime Minister George Grenville, faced two major problems with their new empire. 1st. England had fought with its European rivals for almost one hundred years, on and off. In the course of those wars a large debt had been accumulated. During the most recent conflict it had more than doubled. The people of Great Britain were already heavily taxed. The recent Cider Tax (1763) was met with riots in England So, the question Parliament faced was, where could they obtain additional revenue to service/pay off the debt? 2nd. At the conclusion of the war in North America, England had almost 10,000 soldiers stationed there. Now that the war with France had concluded, what was Parliament to do with them? Parliament certainly did not want these men returned to the homeland and swelling the ranks of the unemployed. Included in that number were over 1,500 commissioned officers who were well connected with members of Parliament and with the landed aristocracy and mercantile class, too. So, they had influence. It was therefore considered politically prudent to keep all the British forces stationed in North America at the end of the conflict with France, employed and stationed there. And, it was also decided to tax the colonists in order to pay the salaries of the British military personnel. And to require the colonists to feed and house British military personnel so stationed there. This was something new. The British Parliament had never before directly taxed their American colonists. So, the Stamp Act of 1765 was passed. It required that many printed materials in the colonies be produced on stamped paper produced in England which would carry an embossed revenue stamp. These printed materials included legal documents, magazines, playing cards, newspapers and most other types of paper used in the colonies. The tax had to be paid in valid and scarce British currency. No payment would be accepted in colonial paper money. The required stamp for lawyers and college students was seen as an attempt to limit the growth of a professional class in the colonies. Violations of the act were to be tried in Admiralty Courts, not colonial courts. The imposition of this tax was thus seen as an attempt by Parliament to limit the freedoms enjoyed by colonists. 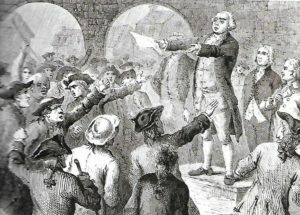 The majority of colonists objected to the tax. As Englishmen, they believed they could not be taxed without their consent. Since they were not represented in Parliament it was a violation of the British Constitution and their rights as Englishmen. They argued that only their colonial legislative bodies could give such consent. Thus, resistance came from all thirteen colonies. The Stamp Act Congress held in New York was the first joint colonial response to an act of Parliament. Also, Committees of Correspondence were set up thus creating a system of communication and cooperation between people in all thirteen colonies. Violence was used to intimidate distributors of the stamped paper. Thus the tax was never properly collected. Another part of Prime Minister Grenville’s program was an import tax on molasses in the Sugar Act of 1864. This was intended to freeze out foreign competition and create a monopoly for British investors in the West Indies. This was seen as another attempt by Parliament to limit economic freedoms in the colonies. This tax failed because of colonial smuggling and bribes paid customs officials. In the next newsletter, I will continue to describe the growing dispute between Parliament and the colonists. 1. An understanding of imperial control relative to colonial self-government. 2. A working relationship which dealt with the principle of Parliamentary authority and colonial liberties. 3. A recognition by the colonists that King and Parliament had exclusive authority over foreign affairs, war & peace and overseas trade. 2. Appoint most of their own officials, fix their salaries, maintain colonial militias and commission colonial militia officers. 3. Appoint & pay judges. 1. Freedom of the press, speech & assembly. 3. Trial by a jury of their peers. 4. Exemption from impressiment into military service. 5. Protection from search/seizure of their property except by legally obtained search warrant/court order. 6. Skilled trades/professions that were open to all. 7. The right to vote. 8. Access to the cheap lands of the West. 9. The right to keep and bear arms. With the elimination of the French, the colonists of the thirteen British colonies expected to continue the nature and elements of the relationship they had enjoyed with the King and the Parliament prior to 1763. That expectation would quickly be dashed. In the next newsletter, I will describe the nature of the post-French 1763 colonial program devised by British Prime Minister Grenville’s government. The first British colony was successfully founded in North America in 1607 at Jamestown,Virginia. The second British colony established was 617 miles to the north at Plymouth, Massachusetts . The hardy souls who survived their first winters were separated from England by an ocean and a perilous sea journey of months. In addition, they were not even aware of the other colony. Instead, they were separated by dense forests with no roads. So, they had to survive alone without the support of those in either Great Britain or North America. Those who managed to survive the early years, had learned how to do so on their own. They all had learned the hard way that no title conferred by the crown, parliament or trading company would provide food or security. The fools who thought that, lay buried in New World burial grounds. The hundreds who did survive the brutal early years became a spirited race of people. They prized their independence and did not tolerate those who followed with titles and other trappings of the Old World.